The bone tissue is an especially interesting subject of scientific research, as much for the frequent osteoporosis as for the formative nature of organism. Natural bone is mostly composed of nanostructural calcium phosphate (hydroxyapatite). Whether bone trauma was caused artificially or through illness, the number of reconstructions increases every year worldwide and thus the monetary investment into this field. Until now, numerous kinds of biomaterials were used for this purpose. Development of equipment and progress in characterization techniques and devices enabled an exponential development of new and advanced biomaterials’ synthesis. Many qualitative and quantitative content concepts and the organization of biomaterials on all structural levels were taken from nature. Biomaterials for the reconstruction of bone tissue, very similar to human tissue, in the form of composite blocks, injectable cements, nano-fillers, etc., were produced this way. Synthesis of calcium phosphate and hydroxyapatite, as well as the composite for the reconstruction of bone tissue, has been a significant research field of a section of Advanced Materials and Processes Department of the Institute of Technical Sciences of the Serbian Academy of Sciences and Arts (ITS SASA) from Belgrade for a number of years. Apart from a number of published scientific papers in leading international journals, lectures presented at the leading universities worldwide, several PhD dissertations defended at various faculties in the land, and several domestic patents, researchers have established the basis of the technological procedure and the production of small series of various products developed in their laboratory. These researches have very wide aspect of significance – from fundamental, scientific to specifically applicative. It can be said that these researches include everything from synthesis, processing, characterization to their application. This book contains 44 papers published in SCI journals since 1999 until May 2007. 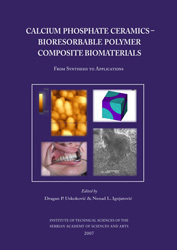 It is divided into five sections and each assembles the most important results in the specific area: I Synthesis and Processing, II Synthesis, Properties and Characterization of Biomaterials, III Mechanical Properties and Modelling of Biomaterials, IV Biological Evaluation of Biomaterials, V Behaviour of Biomaterials under Radiation Field.